Thrive Scrambled Egg Mix is an all-natural and long-lasting dried egg product that will be a perfect addition to all your baked goods and egg dishes. 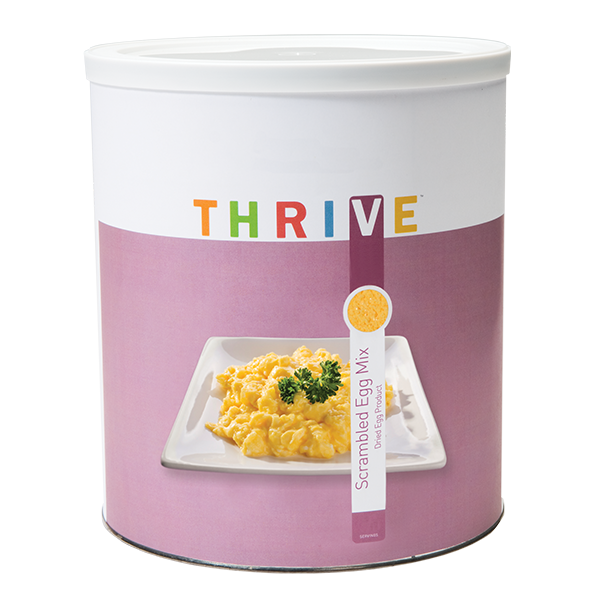 Thrive Scrambled Egg Mix contains no preservatives. They taste fresh and natural, and whip up quickly. To make 1 egg, mix 2 tbsp. Scrambled Egg Mix with 3 tbsp. water. Our scrambled eggs are crystallized instead of powdered like our Whole Eggs, making them the best egg product for eating on their own. You can also bake with them like our whole eggs! Try adding some Instant Milk powder in with the water when you prepare them to make your eggs even tastier. Add your favorite THRIVE meats, veggies, and cheeses for fantastic omelets!